July 1st is almost exactly Mid Year, yes ALREADY!! 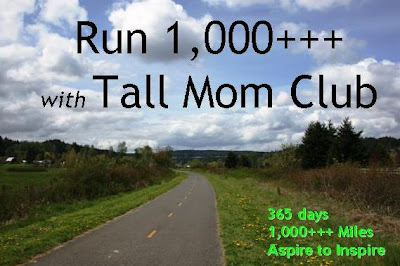 Mid Year means it is time for a Tall Mom 1,000+++ club check-in!! I am so PROUD of this club. I love clicking around and seeing the logo of those who have chosen to strive for 1,000+++ miles this year. Click a name below to be linked to the Blog or website of the Club Members. Year to Date totals are based on each person updating their own mileage, if it is not correct leave a comment, or better yet, UPDATE the SPREADSHEET :) I sorted this time by Most Miles Run, Congrats to Karyn!! Wow what a Club!! Round of Applause for all of your hard work!! Keep up the amazing effort, that 1,000th mile and beyond will feel so amazing. I have to admit I have been a SLACKER, not in my miles but in responding to emails for those who want to join the Club. I have a folder FULL of new Member requests. So here is the ANNOUNCEMENT! I will be opening the club to new members for 1 Week, ending on 7/11. The catch? You should have minimum of 333 miles run/walked/swam so far in 2010. If you would like to add to the Club please email me at Tallmomontherun (@) hotmail. WOW! That's A LOT of miles!! Woo Hoo!!! I have 361 and I am sending you an email right now! Can we add "biked" to the way we get our miles? I know, for me, I have to get more miles in biking because my IT band and ankles bug me so much. I know there's no official rules ;) Thanks for the update Mel and Way to go everyone!!! Keep up the great work, 1000+ miles is around the corner. Awesome! I've been waiting since March to get into the club! Yahoo!!!! What a great example of strong women!!! You should be so proud of what you have inspired in us all! oh no Mel!!! I wasn't updated! I had almost 100 more miles in June :) I updated the spreadsheet. Nowww this is making me want to be in first even if that means running 20 or so extra miles a day :) way to unleash the monster. Way to go everyone! Woohoo! No matter the number as long as you keep moving forward = success. I have to stay on top of updating! but I'll never catch Karyn. Wowza! Congrats to everyone! How exciting! Just sent you an e-mail!